• Design to API 594 and API 6D. 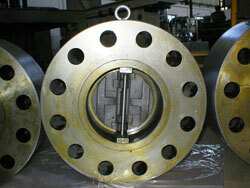 • Metal to Metal Seat tightness is as per API 598 and on specification to API 6D. • 85 Deg Door opening of Dual Plate Check Valves, offers minimum pressure drop as compared to conventional Swing/ Lift Check Valves. • Independent Torsion Spring prevents water hammer, this is a proven concept and edge over conventional valves. • Fire Safe Design, Cryogenic Tested design for Low Temperature and High Pressure design capabilities are the key features of Dual Plate Check Valves. • Dual Plate Check Valves are available with different type of end connections like, Wafer Ends, Flanged Ends and Solid Lug type. • Rating : ANSI #150, #300, #600, #900, #1500 & #2500. • Material : Generally, ASTM Gr. WCB, Gr. LCC, Gr. LCB, Gr. CF8, Gr. CF8M, Gr. CA15 but not limited. 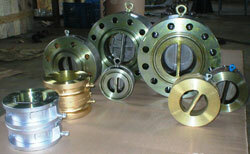 Other exotic material like, CF3M, CF8C, Monel, Hastealloy, Duplex, Super Duplex, Aluminum Bronze etc. on request.